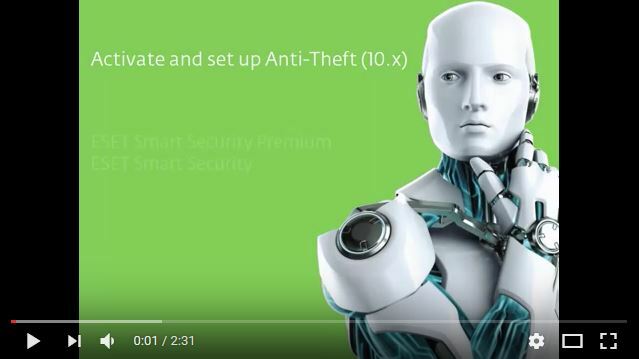 This video demonstrates how to activate and set up ESET Anti-Theft. 1. Open your Windows ESET product. 2. Click Setup → Security tools. 3. Click the slider bar to activate Anti-Theft. 5. Type a name for your device in the Device name field and click Next. 6. Click Create account online. You will be redirected to my.eset.com to create an online user account that will be used to access Anti-Theft. 7. On my.eset.com, complete the registration form (all fields are mandatory). 8. Click Optimize this device. 9. Click Create Phantom account. The phantom account helps to recover your device should it ever become lost or stolen. The phantom account is required to fully utilize all of the Anti-Theft features. 10. Click Create Phantom account. The default phantom account name is “John”. It is not necessary to change the Phantom account name. 11. After creating the Phantom account, your Anti-Theft account is fully optimized. Your device will be shown as Not missing. 12. Click Finish Anti-Theft association → Finish. This device is associated to your my.eset.com account and ESET Anti-Theft is enabled. All devices associated with your my.eset.com account are accessible from the Anti-Theft tab of the my.eset.com web interface. Click View details to manage a device’s status, activity, diagnostics, messages and other settings. For more information on my.eset.com, refer to the My ESET Online Help topic.